Photography Start™ is the ultimate training guide for budding photographers who want to master shooting in manual mode without thinking, capture tack-sharp photos every time, and want to learn to take advantage of the functions of their cameras. But any beginning photography class can teach you the buttons and the dials. Photography Start adds tutorials on the three things that really make a photo look professional: excellent compositions, great lighting, and post-processing. Your instructor will take you on location in many of the videos and show step-by-step how he creates gorgeous photographs with even the most basic gear. Each lesson teaches you a new technique, with many videos filmed on-location so you can see exactly what to do to produce professional-quality photos. Get the highly-reviewed 83-page eBook “Improve Photography: How budding photographers can get pro results”. The videos and eBook are yours to download and keep forever. Watch them on any device, as often as you like, for years to come. After teaching thousands of photographers and seeing the stages they go through as they progress, Jim has created a unit specifically on how to quickly get to taking pro-quality images. This is the unit that most photo classes skip over, but which makes the biggest impact in your work. Jim shows you with on-location videos how we finds great lighting to take ordinary landscapes and make them look incredible! In Unit 2 of Photography Start, you will learn to shoot in manual mode without even thinking about it. It's easy if you'll let us explain the concepts and spend some time practicing along with the video tutorials. But you'll also learn to take tack sharp photos every time with the lessons on proper focus technique. Focus is the #1 technical problem we see in student's photography when we do portfolio reviews. We have dedicated several lessons to teaching the proper focus technique so you can get tack sharp photos with crisp detail every time. Photography certainly isn't all about the gear, but having a quality kit of gear can help to give new photographers quick success. Jim helps you get your kit in order in this section and will save you tons of money by learning where you can save on less expensive items, and what lenses will give you pro results at a lower cost. There is so much more to photography than you could ever learn in just one class. This unit helps to introduce you to different genres of photography so you have the confidence to take on close-up photography projects, off-camera flash, post-processing, and more. All 5 units are included for one low price in Photography Start. Jim Harmer is ranked in the top 40 most popular photographers in the world, with a million followers on social media. 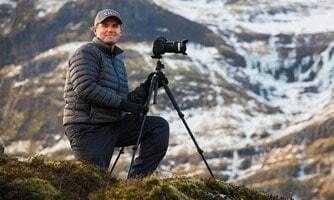 He travels the world to holding his popular, completely free photography meetups with his readers across the globe and hosts the Improve Photography Podcast each week. His photographs have been purchased by private art buyers as well as large publications such as Time, Readers Digest, and Nikon. Jim is well known for his easy-to-understand and down-to-earth teaching style. View Jim Harmer's Portfolio here.